After Sales Manager, Marcel Fabris will be our host from PCSS and will talk for a few minutes about the After Sales aspects of the dealership. We will then have a brief demonstration by a representative from Permagard (Porsche's only approved paint rejuvenation / protection brand of their fantastic products). PCSS will be offering a door prize to club members who own a Porsche, of a full Permagard Light Rejuvenation Treatment (incl. interior detail) valued at $995.00. This prize will be drawn on the night and we request that the treatment be applied to the winner's car in the next month. 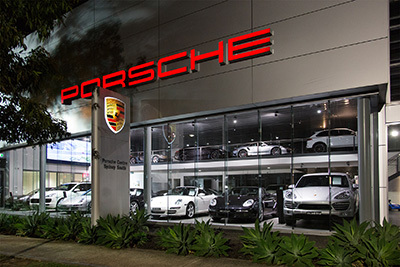 In return, we would appreciate if the winner could write a brief article of their visit to the dealership and result of the paint rejuvenation / treatment for inclusion in Porsche Power with some glossy pictures. Former PCNSW member Tony Norman, who is now the Competition Secretary of the Classic Rally Club, will give a short talk on the history, ideals and events run by the CRC. It is hoped that PCNSW members might be encouraged to consider trying one of the many rallies that the CRC organise throughout the year. Tony will happily answer any general questions from the floor and will be available to provide more detailed info after the formal closure of the meeting. Members looking for a quick meal beforehand head to the pub nearby on the corner of Gardiners and Botany Roads around 6:00. There is a good bistro out the back with large tables.